FALL RIVER, MA--(Marketwire - Feb 15, 2012) - Rex-Cut Abrasives has introduced a line of round and square, nonwoven cotton fiber finishing sticks that are ideal for delicate jobs such as mold repair, tool and die, and jewelry repair. 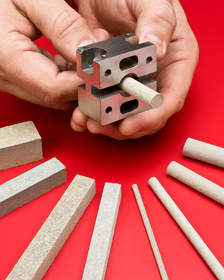 Offered in a variety of sizes, these hand-held finishing sticks can also be used in machines. Rex-Cut® Cotton Fiber Finishing Sticks are made from reinforced nonwoven cotton fiber with aluminum oxide and silicon carbide abrasives that are pressed and bonded into various shapes and sizes. Designed to deburr and finish in one-step without changing a part's geometry, they are easier to work with and more forgiving than vitrified sticks. Featuring a wide selection of sizes that can be matched to fit into holes, slots, and other delicate details, Rex-Cut® Cotton Fiber Finishing Sticks are suitable for hand-held or machine deburring operations. They are available in 1/8" to 1" dia. round and square sizes in 4" to 6" lengths, with 24 to 320 grain sizes, and soft, medium, and hard bonds. Rex-Cut Products, Inc. is the oldest manufacturer of cotton fiber abrasive grinding and finishing products in the world. Since the early 1920s, they have been manufacturing a non-woven cotton fabric that is impregnated with abrasive grit and then pressed and formed into various shapes. These specialty abrasive products constantly reveal fresh abrasives as they work. In 2008, Rex-Cut became 100% owned by its employees, a loyal team of local folks who have a true interest in the continued success of the company. Rex-Cut offers a broad line of reinforced nonwoven cotton fiber specialty abrasive products for a wide range of grinding, deburring, blending, and finishing operations on stainless steel, exotic alloys, aluminum other metals, fiberglass and certain composites. Rex-Cut Abrasives' line of round and square, nonwoven cotton fiber finishing sticks are ideal for delicate jobs such as mold repair, tool and die, and jewelry repair.